Many patients with acute stroke do not receive recommended care in tertiary hospital settings. Allied health professionals have important roles within multidisciplinary stroke teams and influence the quality of care patients receive. Studies examining the role of allied health professionals in acute stroke management are scarce, and very little is known about the clinical decision making of these stroke clinicians. In this study we aimed to describe factors that influence the complex clinical decision making of these professionals as they prioritise acute stroke patients for recommended care. This qualitative study was part of a larger mixed methods study. The qualitative methodology applied was a constructivist grounded theory approach. Fifteen allied health professionals working with acute stroke patients at three metropolitan tertiary care hospitals in South Australia were purposively sampled. Semi-structured interviews were conducted face to face using a question guide, and digital recording. Interviews were transcribed and analysed by two researchers using rigorous grounded theory processes. Our analysis highlighted ‘predicted discharge destination’ as a powerful driver of care decisions and clinical prioritisation for this professional group. We found that complex clinical decision making to predict discharge destination required professionals to concurrently consider patient’s pre-stroke status, the nature and severity of their stroke, the course of their recovery and multiple factors from within the healthcare system. The consequences of these decisions had potentially profound consequences for patients and sometimes led to professionals experiencing considerable uncertainty and stress. Our qualitative enquiry provided new insights into the way allied health professionals make important clinical decisions for patients with acute stroke. This is the first known study to demonstrate that the subjective prediction of discharge destination made early in an acute admission by allied health professionals, has a powerful influence over the care and rehabilitation provided, and the ultimate outcomes for stroke patients. Despite strong evidence to guide best-practice care for all stroke patients, many patients do not receive recommended care [1, 2]. Less than optimal care can lead to poor stroke outcomes [3, 4]. It is therefore essential to understand why care varies so that clinical quality improvement initiatives can be effectively targeted. The predominant research on the quality of care provided to patients with acute stroke has used quantitative methodologies to explore medical interventions or healthcare systems. Quantitative studies have linked the quality of care received by patients with acute stroke to predictor variables such as age [5–7] and day of hospital admission . As part of a larger mixed methods study, we have also published quantitative research that investigated associations between the quality of care acute stroke patients receive from AH professionals and various predictor variables including age, gender, stroke severity, Charlson Comorbidity Index, English proficiency, previous accommodation, previous independence level [2, 9]. There is a growing body of literature that acknowledges the influence of the organisational structures or systems on the quality of stroke care and patient outcomes. Patients’ with acute stroke achieve the best outcomes if cared for in stroke units where coordinated team based care is provided by professionals with specialised skills . In addition to the influence of organisational structures, the processes of care that patients receive is a consequence of the multiple clinical decisions made by members of the clinical team. There is a current lack of understanding of how and why stroke clinicians, including allied health (AH) professionals, make decisions regarding clinical care. The Australian Clinical Guidelines for Stroke Management  state that AH professionals are key members of stroke teams and these teams usually include physiotherapists, occupational therapists, social workers, speech pathologists, dietitians and psychologists. Their roles include the clinical assessment of the consequences of stroke, the provision of early therapy and rehabilitation, the prevention and management of complications, and discharge planning. Many decisions in stroke care, such as patients’ discharge destination and suitability for rehabilitation, are not made on purely medical grounds. AH professionals have a key role in determining patients’ safety and rehabilitation potential, and are strongly positioned to influence patients’ outcomes. Studies examining the role of AH professionals in acute stroke management are scarce, and very little is known about the clinical decision making of these stroke clinicians. Qualitative research methodology is most appropriate for understanding complex constructs such as decision making . To date however, there has been very little qualitative exploration of the underlying drivers of decisions regarding any care that stroke patients will, or will not receive . In this qualitative enquiry, our aim was to explore how and why AH professionals make decisions about clinical prioritisation and the processes of care they provide, or don’t provide, to patients with acute stroke. We sought to incorporate their voices to help describe the meaning or intention behind different care decisions and the types of care being provided. This article will focus on the qualitative enquiry within our larger mixed methods study. Mixed-methods research allows a more complete understanding of acute stroke care though the integration of both quantitative and qualitative methods . We conceived a mixed methods study to explore the factors influencing the quality of care provided to patients with acute stroke by AH professionals. The four largest tertiary hospitals that admitted acute stroke patients in Adelaide, South Australia were approached to participate. One site was subsequently excluded as it was undergoing organisational changes that would have confounded the research. At the time of the study the three participating hospitals admitted between 180 – 450 acute stroke patients per year. Details of the quantitative study are published elsewhere [2, 9]. In summary the quality of care provided by AH professionals for consecutively admitted acute stroke patients was determined by the adherence of care to 20 predetermined evidence-based AH process indicators. The retrospectively audit of 300 patients at the three participating hospitals (100 per hospital), found poor adherence to recommended care for most patients (see Additional file 1). A concurrent qualitative study (reported here) then explored this issue further. In the larger study, a final step of mixed methods analysis merged and compared the results from the two methodologies . The side-by-side comparison technique described by Creswell & Plano Clark was used to undertake the final mixed methods analysis . In this study we chose a constructivist grounded theory approach which is recommended when examining poorly understood phenomenon . Using this methodology we explored the perceptions of AH professionals regarding their decision making and the prioritisation of acute stroke patients to receive various assessments, rehabilitation therapy and other elements of recommended care. Ethical approval was obtained from the University of South Australia’s Human Research Ethics Committee, the Southern Adelaide Clinical Human Research Ethics Committee and the Central Northern Adelaide Health Service Ethics of Human Research Committee. AH professionals at the three audited hospitals in South Australia were invited to provide informed consent to participate if they had worked with acute stroke patients at their hospital for at least six months. Interviews were conducted during 2010 at a convenient time and place for consenting participants. Following purposive sampling principles, we recruited a mix of qualified physiotherapists (PT), speech pathologists (SP), occupational therapists (OT), social workers (SW), dietitians (DN) and psychologists (PS) across all three sites. No more than two representatives from the same AH discipline were recruited from a particular site. We recruited 15 allied health professionals, five from each case study site. We conducted interviews with five PTs, three SPs, three DNs, two OTs and two SWs. Interviewees had various levels of experience and seniority within their hospitals, ranging from inexperienced first year graduates to very experienced professionals with over 20 years’ work in stroke clinical and leadership roles. We were reassured that thematic saturation had been reached for this sample of AH professionals, as no new concepts emerged during the last three interviews. Thematic saturation was not assessed for discipline subsets. Using an interview guide we conducted semi-structured interviews which allowed for probing or additional questions as interesting concepts emerged (see Table 1). These guiding questions were informed by an extensive literature review , the results of our earlier quantitative study [2, 9] and the interviewing framework suggested by Charmaz . Interviews were audio recorded and transcribed verbatim. We returned the transcripts to participants for member checking to allow them to clarify their intended meaning if required [15, 17]. Throughout the interviews, field notes were taken to allow us to add context and richness to the data collected and to facilitate the tracking of our thinking and decision making processes . Prior to analysis, interviewees and hospitals were de-identified. Unfortunately equipment failure led to the loss of one digitally recorded interview so that field notes only were analysed for this participant. What do you like and not like about working with stroke patients in this hospital? Tell me about your work with stroke patients who at this hospital. How are clinical decisions made in your hospital, regarding the clinical management of individual patients? How do you prioritise your clinical work? What do you consider when deciding on a patient’s potential to benefit from rehabilitation? Are there any systems or tools available to you in this workplace to help you with prioritisation of your clinical workloads? How confident do you feel in your knowledge of acute stroke management? Are there other issues that influence your work with acute stroke patients? NVivo 8 computer software assisted us with data management . Analysis was undertaken in line with Charmaz’s constructivist grounded theory approach . We developed familiarity with the data through repeated listening and reading of the interviews. The transcripts were inductively coded by two independent researchers (JL & IE), according to the grounded theory processes of open or initial coding, focused coding, axial coding and theoretical coding [15, 20]. We commenced open coding during the data collection period . This enabled early analysis and preliminary thematic interpretation to inform our later interviews if required. This initial coding stayed close to the data, by coding directly onto transcript margins and using in-vivo codes and direct quotations . Through a collaborative approach with regular meetings, we added depth to our understanding, established consensus and developed focused coding of the emerging concepts. Common themes emerged regarding AH professionals’ clinical decision making and patient prioritisation. This iterative process of developing emergent themes was captured in memos, using NVivo software and also represented figuratively in concept maps (see example Figure 1) [21, 22]. Through this constant comparison we sought relationships between themes to form the basis of emerging assertions and theories regarding issues of relevance to the research focus [15, 23]. Concept map of themes emerging from the data. The main emergent themes were prediction of discharge destination, pre-stroke status, the stroke, stroke recovery, the system, and deserving a chance, each of which had several sub-themes. The interviewed AH professionals from all disciplines described the need to make complex decisions about the priority of individual patients to receive specific recommended processes of care. The prediction of discharge destination emerged as a dominant and unexpected driver of decisions for AH professionals regarding the care patients would receive. This concept of discharge prediction had important implications for patients and required staff to consider factors that fell broadly into four categories: the patient’s status before their stroke, the nature of their stroke, their course of stroke recovery and organisational factors within the health system. In a fast paced, multi-disciplinary clinical environment, where the organisational priority was to maintain a smooth, swift flow of patients out of the acute setting, interviewees conveyed a desire to give patients ‘every chance’ to make an optimal stroke recovery. This complex interplay of factors caused uncertainty for AH professionals and in some cases distress. Thinking about what’s the ultimate goal . . . Is the aim to get them home? Is the aim to improve their function to, perhaps instead of going into [nursing home] care, going into [hostel] level care? You need to have that clinical understanding of what’s likely to happen with a patient with a certain type of stroke…So if you’ve got an idea of where they are going you can adapt your plans and interventions more specially to those patients I guess. Patients became a low priority for AH care if they were thought to be destined for residential care placement, or were on a palliative care pathway. Well once people are accepted for rehab that becomes then a [low] priority. Unfortunately, in this environment, therapy is lower priority, because we’re having to be reactive to all the discharge issues in this environment. Unfortunately. When we are really busy and we have to drop people off the list, the nursing home assessed patients get dropped off the list first. People who we know are going to go to rehab and have already been accepted are dropped off the list as well which is unfortunate. The consequence of this was that patients deemed to need stroke rehabilitation were no longer likely to receive that care in the acute setting and so important therapy would be delayed until a bed was available in a post-acute centre. So our first sort of consideration would be in the morning, the new patients and the ones that don’t have clear sort of pathways that they’re on . . . and being able to determine whether or not they are rehab or whether or not they are not rehab. The ideal patients maybe from the system’s point of view that will move through the system quicker and get back to their home rather than getting stuck in a bed. I think that whilst it may not be in writing, I think that it’s not always looked on as favourably if the patient doesn’t have a discharge destination. The challenge is often that we see them when they are at their most severe …I think if you have only ever worked with stroke patients in the super-acute setting you don’t realise how well they do further down the track and what the signs are of who’s going to do better or worse despite the severity of their disability. Several less experienced AH professionals described acute stroke work as very demanding and that it took time and additional training to develop the necessary skills. One PT reported the surprise of encountering a patient who, against the odds, made late, unexpected improvements just in time for it to be considered in destination decisions. This illustrated the risks of using destination as a driver of care decisions for this patient group in a fast-paced environment where important judgments are made early in admission. 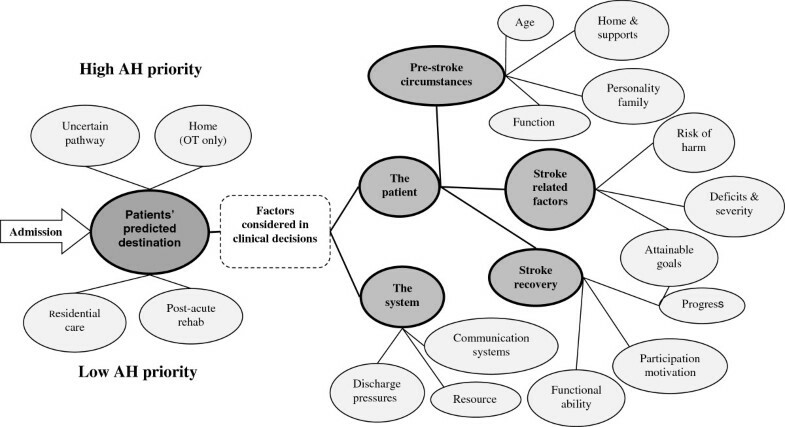 The decision making regarding destination was influenced by a complex interplay of factors related to the patient, their stroke and also health system variables as discussed below. When clinical care decisions were made, including the prediction of discharge destination, factors associated with a patient’s health and lifestyle prior to their stroke were considered. I guess you hear even rehab doctors talking about it all the time, ‘We better give that person in their 40s every chance’. But you don’t hear them talking about that with someone in their 80s. While some interviewees spoke of ageist inequities in care others argued that it was the factors that could accompany older age, or age proxies, which were the true drivers of care decisions. Actually I don’t think age per se. I think level of function prior to admission is actually more important. . . . And when I am thinking of rehab it is thinking about, you know, what were they like, what will they be going back to, not about age per se, reported one SP. Patients were considered good candidates for rehabilitation, or for discharge directly home, if they had been previously independent and if they had adequate family supports available. A previously proven physical capacity to undertake the rigors of intensive therapy was also deemed necessary before referring to post-acute rehabilitation. Interviewees acknowledged that the personality and assertiveness of patients and their families occasionally had an influence on care decisions. Where patients or families were particularly anxious or demanding of more therapy, this was sometimes provided even if not considered to be a clinical priority. Although English as a second language ESL was thought to delay care on occasions when interpreters were required, no one reported that patient’s priority for care was influenced by their cultural background. The prediction of discharge destination also required consideration of the type of stroke sustained and the course of recovery. Certain stroke-related deficits placed patients at risk of further deterioration. A common example was swallowing disorders which increased the risks of aspiration pneumonia and malnutrition for patients and therefore made these patients a high priority for attention from SPs and DNs. Although predicted discharge destination appeared to determine the clinical priority for most stroke patients, these very high risk patients were an exception and were a priority for AH care irrespective of their discharge path. Certain stroke-related deficits, such as severe cognitive impairments, also influenced the ability of patients to receive recommended care. Those patients who are more reliant on your help in rehabilitation have more priority with me. I find that a lot more rewarding. They [post-acute rehabilitation hospital] tend to take those patients that are maybe going to get back to almost the way they were previously pre-stroke. The perception of staff regarding the course of stroke recovery in the acute setting was a key consideration for important clinical decisions, such as patients’ suitability for post-acute rehabilitation. It was important for patients to demonstrate progress in stroke recovery and AH professionals saw that an important part of their role was to facilitate this demonstration of progress. Before I refer them to rehab we like to know that they are making gains, even if they are small gains reported one PT. Patient’s capacity or willingness to actively take part in therapy sessions affected their priority for AH professionals’ attention. A big thing is if they are participating with the acute OTs and physios, because if they are not participating with them it is highly unlikely that they will participate with [post-acute rehab]. Many interviewees reflected on the role of motivation in patients’ stroke recovery and the care that they received. Patients who were unmotivated to participate in therapy sessions were difficult and often unrewarding for AH professionals. Several interviewees reported that it was an important part of their role to try to motivate patients by using strategies such as building rapport or developing patient-centred goals, while others felt it was beyond their influence. If [depression] is not recognised and that is not treated then often people will be written off as not engaging in rehab and diagnostic therapy, when in fact it is depression. The complex interplay of variables related to an individual patient’s clinical presentation was further complicated by the influence of issues stemming from the health system. The system in which AH professionals worked had a reported influence on the quality of care that they provided. ..there is only a limited place for rehab beds in the state and that’s a big factor to decision making. You are sitting there [at discharge planning meetings] thinking in your head that those beds should be used well in a way if that makes sense. The pressure to move patients rapidly out of the acute hospital was considered to be a significant influence on the care patients received. Hospital priority systems were in place to manage the risk of low bed capacity and this demanded that all AH professionals made patients’ discharge a clinical priority. The overpowering effect of discharge pressures strongly influenced the entire clinical priority and decision making process for all AH professionals. There was awareness that patients with unclear discharge destinations presented a risk to the smooth flow of patients through the acute and post-acute hospital systems, and justified making them a clinical priority. We constantly negotiate with each other … it is that fine line, if you put it [referral to post-acute rehab] in too soon you will get knocked back, if you put it in too late they are hanging around, reported one PT. As detailed above and in the concept map (Figure 1), interviewees described a process of complex clinical decision making in which multiple factors needed to be considered concurrently, and frequently resulted in AH professionals experiencing uncertainty and stress. AH professionals conveyed a strong sense of responsibility for the outcomes of their patients and an ethical sense that “everybody probably deserves a chance”(PT). There was a high level of awareness of the evidence-based recommendations for stroke management. This was offset by a clear recognition that some patients had greater difficulty securing recommended care such as post-acute rehabilitation. Patients considered to be at-risk included those with more severe strokes, older age, lower levels of home support, cognitive deficits and poor motivation or depression. The challenge of securing rehabilitation opportunities for at-risk patients placed pressure on acute AH staff to advocate for these patients and demonstrate a potential to make functional improvements. I think I tend to spend a lot more time on the younger demographic . . . and I’m not sure how comfortably that sits with me now, now that I’ve actually mentioned it. I don’t enjoy the lack of funding, resources, man power in the acute setting and the feeling that I wish I could do more for patients, and I’m not always able to because of those restrictions . . . So I feel a bit torn sometimes by that, because I don’t like going away feeling like I haven’t done my best, but I’ve done what I could in the time available. The main theoretical contribution made by our study was the emergence of ‘predicted discharge destination’ as a major driver of care decisions for this professional group. This new understanding of discharge destination as a determinant of care is quite different from our usual consideration of discharge as an outcome of care. The determination of a discharge destination was a priority task for AH professionals, and patients with unclear discharge pathways were given precedence for attention. Once a discharge decision was made for a patient it had an overriding influence on their priority to receive processes of care from AH professionals. This had major potential consequences for many patients. Those thought to be destined for discharge directly home or to post-acute rehabilitation centres were unlikely to receive any further therapy in the acute setting, and patients waiting for discharge to a residential care bed became a very low priority for AH care. Only those patients deemed to be at high risk of deterioration, such as those with stroke-related swallowing problems, remained a high priority for AH irrespective of their discharge pathway. Our interviewees reported the regular employment of high level, complex clinical decision making. Recent research reported that well developed clinical decision making skills require access to a variety of clinical experiences and sufficient time for skill development . Participants in our study, with varying levels of experience, reported that clinical experience was particularly important in the specialised field of acute stroke management. In many settings the reality is that novice AH professionals are placed on short roster rotations to work with acute stroke patients. These novice staff might not have the opportunity to develop the necessary level of clinical problem solving skills prior to making complex decisions, which could then have profound consequences for patients. The power of “predicted destination” to drive care decisions and clinical priority presents particular problems for the quality of care received by patients with acute stroke. Stroke recovery is often unpredictable and complicated by the inability of some patients to demonstrate their potential to make recovery during the early days after stroke onset [25, 26]. In post-acute rehabilitation settings the difficulties of team decision making for stroke patients’ discharge destination have been investigated and researchers have recommended the use of objective models to assist consistency and transparency . In acute settings, where there is increased pressure to discharge patients quickly, mistakes can be made if important decisions are made too soon and might result in some patients missing out on opportunities to maximise their recovery. AH professionals worked with high levels of clinical uncertainty within a fast paced health system driven by pressures to discharge quickly. Our study revealed a tension between what AH professionals knew to be best practice or ethically correct, and what they could actually provide for their patients. Staff were left to rationalize and manage the resulting distress sometimes experienced. Our findings are limited by a relatively small sample size. We are reassured by the depth and richness of interview data we gathered and our determination that data saturation had been achieved. Data collection from several AH disciplines at multiple hospitals added credibility to our findings. Our study sought to understand the way AH professionals make care decisions for acute stroke patients. We acknowledge that these clinicians are components of larger stroke clinical teams, and that the decision making of nurses, doctors and other professions also impact of patient care. We also acknowledge that our study was conducted in one Australian city and therefore findings might not fully transfer internationally where health systems will vary. The discovery of ‘predicted discharge’ as a driver of care quality provides important new information for future clinical quality stroke research. Discharge destination is usually considered to be an outcome of inpatient care rather than a causal factor for the quality of care patients receive. Previous quantitative enquiry has therefore not factored discharge destination into statistical modelling when investigating the determinants of care quality. Future research can now test whether discharge destination, or its prediction, is supported statistically as well as qualitatively as a driver of care. Allied health professionals working in acute hospital settings, undertook complex decision making when deciding on the processes of recommended care that patients would or would not receive. Systematic pressures from low allied health resourcing and the need for fast discharge meant that patients were prioritised for allied health interventions. This prioritisation resulted in some patients missing out on optimal care with possible negative consequences for their ultimate stroke outcomes. Prioritisation for care was based on allied health professional’s subjective prediction of the patients’ discharge destination, which in turn was founded on multiple factors, many of which were unquantifiable. The desire to provide fair and unbiased, high quality care for patients drives many initiatives in clinical quality improvement. Given the complexity of clinical decision making for acute stroke patients however, more qualitative and quantitative exploration is required before equitable systems of care delivery will result. The first author undertook this study as part of her PhD which was funded by an Australian Postgraduate Award. We acknowledge the financial support of the International Centre for Allied Health Evidence, University of South Australia for publication costs. All authors contributed to the study design and manuscript editing. JL conceived of the study, performed the interviews, collected, coded and interpreted the data, and drafted the manuscript. JB and KG provided content expertise and critical evaluation. IE advised on the methodology and analysis, participated in data coding and interpretation and provided critical evaluation. All authors read and approved the final manuscript.